The Long Way to a Small Angry Planet was originally funded as a small kickstarter project and self-published as a result. It was such a hit that it found a big publisher, got nominated for a ton of awards and has been raved about by many, many people. What struck me in particular wasn't just what everyone was saying or how many awards it was nominated for. What raised my interest was the type of awards that were included - it was shortlisted for the Arthur C Clarke Award (always one to watch), shortlisted for the Kitches "Best Debut" and Longlisted for the 2016 Baileys Women's Prize for Fiction. The fact that a book that is clearly scifi - and not just scifi but Space Opera at that! - got even nominated for the Baileys means it's got to be something special and one of those break-out novels that become read by a wider audience. As such I thought it only right I get a copy and see what all the fuss is about. The Long Way to a Small Angry Planet is set sometime in the future at a time where part of humanity has spread out to the stars. Those intrepid adventurers that left our solar system become known as Exodans while those who stay and populate Mars become known as Solans. The Exodans meet a number of alien races along the way. Some of them agree to form a coalition which becomes known as the Galactic Commons (GC). The story follows the crew of the Wayfarer as they welcome on board new crew member Rosemary Harper, someone who has never been on a spaceship before and seems to be running from something. Over the first few chapters the viewpoint switches to other members of the crew. We've got the human captain Ashby, a friendly and trustworthy Exodan who seems to be able to bring out the best in people. Then we've got the pilot Sissex from the Aandrisk race - think humanoid but with reptilian like scales and feathers. The Chef of the Wayfarer is known by the name of Dr Chef, as he also doubles as the ships medic. He's a Grum, a big and bulky alien whose enigmatic race doesn't appear to be part of the GC. Kizzy and Jenks (human) are the ships technicians while Jenks friend Lovey is the ships AI. Ohan looks a lot like a simian and is from a race specially suited to navigate the wormholes used to travel vast distances through space. They do so by being infected with a virus called "the whisper" which allows them to actually see space-time in some strange way. Lastly is the ships "Algiest", Corbin who nurtures special forms of algy which acts as fuel for the ship. They form a somewhat motely ragtag but highly effective crew, and the author does a great job of bringing them to life. As mentioned, space travel over any real distance is handled by travel through wormholes - holes connecting two points in real space through "hyperspace". The crew of the Wayfarer are offered a highly lucrative contract building such a hyperspace expressway to a distant planet. It's a job that will earn them enough money to live comfortably for years. The catch? there seems to be some sort of war between the two points along with a number of fragile alliances which could splinter given the wrong move. So on the surface the book is about the journey to this remote planet however what the book really deals with are the modern-day problems of prejudice, cultural acceptance and sexuality. Then there are the other sociological issues that plague our little blue-green planet such as freedom to live how you wish, the thorny issue of euthanasia with a scattering of Guerrilla Warfare thrown in. This is topped off with the emerging issue of Artificial Intelligence - more specifically at what point does it become Artificial Consience or even Artificial Life? What rights should such a being have? It sounds like a lot of serious stuff, and it is, however the author manages to feed all this in to a funny, entertaining and clever story that makes wonderful use of the myraid personalities and group dynamics. It's bold and clever fiction that excites and manages to make you think without realising that it is making you think. This is 21st Century, modern, inclusive science fiction that mirrors the best parts of books written during the "golden age", dealing with big, contemporary issues in a Space Opera setting with unusual races and action and adventure and all the things you'd expect to make up a Space Opera novel. 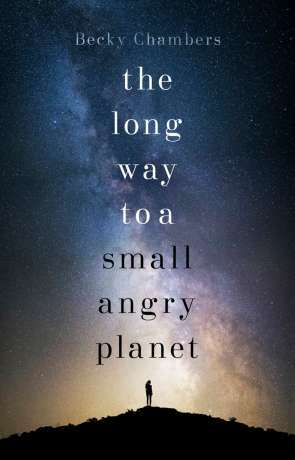 The Long Way to a Small Angry Planet doesn't just deserve to be nominated for awards, it deserves to win some, it deserves to be read by everyone who can get their hands on it and it deserves to help make the author a big deal in literatures, simply wonderful. Written on 11th July 2016 by Ant.